Tribhuvan University, Teaching Hospital Maharajgunj published vacancy announcement for the post House Officer on the contract basis. 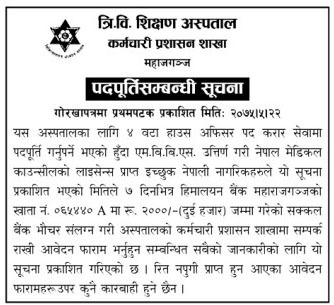 Who passed MBBS and got the license from Nepal Medical Council can apply for this post. Check the official Vacancy Announcement Teaching Hospital (Contract) below.